In the 1970's a CEO might have spent up to 10% of their time on board related activities. Today, that figure can be closer to 20%. In the age of corporate governance, leading and managing have become part time pursuits. Managers are the silent victims of the governance revolution. Forced to split their time between their traditional roles and supporting the board to meet the increasing demands of regulators, analysts and activists. They feed the board's growing appetite for information under relentless "cross examination". And they must do so under a presumptive cloud of suspicion that they're up to no good. Whilst I can't turn back the clock or the tide of expectation of what boards should do, I can offer a way to re-frame the relationship between the board and management so that, for the time they are working together, they are more effective. But to do this it's necessary to go back to square one and reset the relationship. First, let's lose the attitude. "Corporate innovation suffered when the boardmonitored intensely. Companies with such boards invested less inR&D, received fewer patents overall and received fewer influentialpatents as measured by the frequency of citations of the patents theyreceived. In addition, company value was lower when the board devotedgreater time to oversight." Second, let's recognize what's staring us in the face. Directors direct but managers don't just manage. Managers aren't directors but they are part of the team responsible for directing. Once you get this idea the stumbling blocks that have plagued the relationship between the board and management start to disappear. If up to or more than 20% of management's time is spent on the boardroom you'd expect that working with boards would make up a large part of an executive education. No. In fact there is a dearth of material on how to work with boards. If there's an MBA course out there that includes a course on working with boards I'd love to hear about it. The reality for most CEOs and management is that working with the board is ad hoc and improvised and exercised under a cloud of distrust. That's not to say that managers aren't doing a great job in the circumstances. Just that there's no end of best practice on what boards should do and very little on what the rest of the directorship team should be doing. One solution is to use my concept of modes of directing to create a practical guide that reframes the relationship between the board and management. TRADING - Directors directly influence Strength Resilience Endurance (SRE) through the commitments (promises) made on behalf of the corporation. GUIDING - Directors influence SRE by guiding the CEO and other delegates in the way they lead and manage the corporation. HELPING - Directors also influence SRE through their help and support to the corporation. BUILDING - Finally, directors influence SRE through building boardroom talent, teamwork and leadership to work in each of the other three other forms of directing. Over the course of a board meeting and throughout the year the board will move in and out of these modes. The catch is that each mode has a different profile in terms of role and behavior suited to that mode. The goal of an effective boardroom is to ensure that everyone in the room matches their role and behavior to the mode. This includes management. In each mode, the whole directorship team will have different role to play. But get them wrong and you'll have dysfunction and what I call "broken mechanics". This is the secret of mechanics. Static approaches captured in slogans such as "noses in fingers out" are outdated in the modern boardroom. What is needed is flexibility and adaptability to ensure the team is in the mode that will create the greatest value at the time. 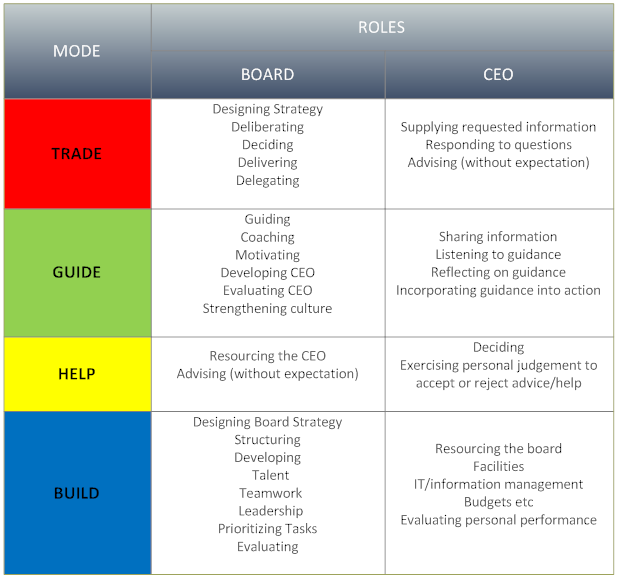 If you want a better relationship with your board or CEO why not start by talking about your modes and mechanics and seeing how well you're aligned?